Studies on animal behavior have shown that working memory functions are impaired when group I metabotropic glutamate receptors (mGluR1/5) are blocked. Entorhinal cortex (EC) has a key role in producing working memory function and enabling long-term memory formation in the hippocampus. Importantly, frequencies observed in EC during behavior are low, typically at or below theta (4–8 Hz). We have in recent work  shown experimentally that in EC pyramidal cells following synaptic stimulation of extrasynaptically located mGluR1/5, canonical transient receptor potential channels (TRPC) can be activated. We hypothesize that the presence of mGluR activated TRPC channels constitutes a mnemonic component, working in parallel with the ionotropic synaptic receptors AMPA and NMDA, each of which with a distinct time window for integration. Thus, TRPC channels with their slow kinetics could be capable of effectively integrating the low frequencies observed in EC. We are using a multicompartmental model including calcium dynamics and several ion channels. It is based on a model of a CA1 pyramidal cell implemented in NEURON  and extended with mechanisms for mGluR/TRPC activation. Synaptic glutamate spillover activates mGluRs, which in turn sensitizes the TRPC channel. This effectively results in a translation of the calcium gating curve. 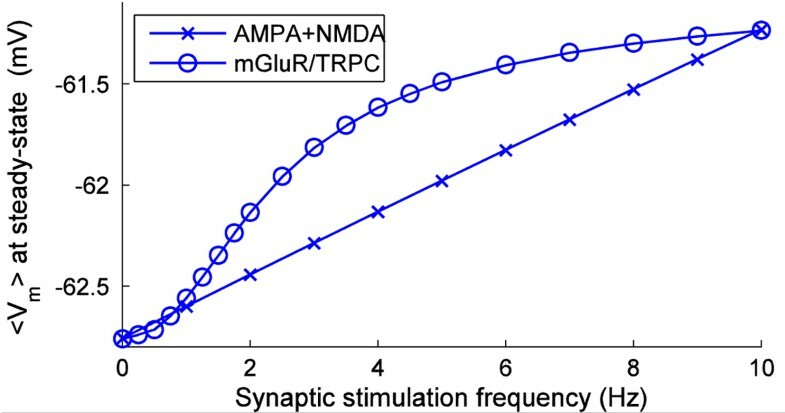 To study the summation of low frequency input, we have applied synaptic inputs to the apical dendrite and observed how the resulting TRPC depolarization relates to the faster EPSPs following activation of AMPA and NMDA receptors. We also studied the TRPC dynamics in terms of stimulation frequency and duration. In figure 1 the individual contribution to membrane depolarization from ionotropic (AMPA+NMDA) and metabotropic (mGluR/TRPC) receptor activation respectively is plotted for a range of frequencies at steady state. The average membrane potential is increasing linearly for ionotropic activation, since the corresponding EPSPs are too brief to effectively integrate at low frequencies. The TRPC current, however, is effectively integrating the synaptic inputs already at low (around 1–2 Hz) frequencies, due to its slow time dynamics. Figure 2 shows the TRPC activation dynamics. The largest increase in channel current occurs for frequencies around 3 Hz, and below durations of 3 s.
We have shown that the mGluR activated TRPC currents in Entorhinal cortex might play an important role for integrating synaptic inputs at low frequencies and durations of a few seconds. Both of these ranges lie in a behaviorally relevant domain.